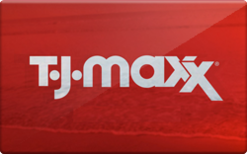 TJ's or TJ Maxx is a major discount clothing retailer. Purchase a discounted gift card to save on top of their cheap prices. You can use the T.J. Maxx giftcard also at Marshalls and HomeGoods.